A Fort Carson brigade will trade its tanks for eight-wheeled Stryker combat vehicles in a move that will make the 4th Infantry Division among the most flexible units in the Army. After the change, the division will have armored, infantry and Stryker brigades, creating a force that can be tailored to meet various global threats. 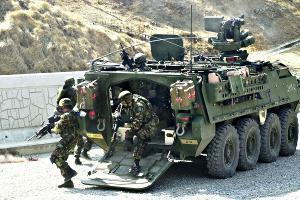 The post’s 1st Brigade Combat team will get the vehicles in as little as two months. “The conversion, scheduled to begin in March 2014, is being made to achieve a needed operational mix of brigade combat teams within the Army, and will take an estimated 10 months to complete,” the Army said in a news release. Fort Carson officials say the move will benefit the post in a number of ways. “By converting an armored brigade to a Stryker brigade, the 4th Infantry Division increases the operational capability and flexibility, while continuing to further Fort Carson’s net zero environmental goals of reducing pollution and fuel consumption,” spokeswoman Dee McNutt said in a statement. The Stryker, added to the Army inventory in the late 1990s, is designed as a quickly-deployable vehicle that can take on roles played by the 72-ton M-1 Abrams Tank and the Bradley Fighting Vehicle. Fort Carson, along with the rest of the Army, is transitioning to a post-war force that is built to quickly deploy to war from bases in the U.S. Strykers, as envisioned, can head to combat almost anywhere within 96 hours. Local business leaders praised the change, which they said could help shield Fort Carson as the Pentagon cuts nearly $1 trillion from its budget over 10 years. With a mix of foot soldiers, Strykers and tanks, the post can mix and match to meet combat needs. The move was made possible by a 2008 environmental impact study at the post that examined future growth. While the study was primarily focused on adding existing 4th Infantry Division tank brigades, which were moved to Colorado from Texas in 2009, it also looked at the possibility of adding Strykers. The Army says the switching to Strykers will have a positive environmental impact at Fort Carson. “Replacing Abrams tanks and Bradley Fighting Vehicles with lighter Stryker wheeled combat vehicles reduces heavy vehicle maneuver and fuel consumption, and is expected to reduce dust and air pollution at Fort Carson,” the Army said. Derived from a Canadian design, the 18-ton Strykers can carry a variety of weapons, including .50-caliber machine guns and tank-killing 105mm cannons. The troop-carrier variant of the Stryker can carry a nine-soldier infantry squad in its hull. The Stryker move comes at a time of sweeping change for the post, which is disbanding one of its brigades in the face of post war budget cuts. The changes will leave the post with the armored 3rd Brigade Combat Team, the foot soldiers of the 4th Brigade Combat Team and the Stryker-armed 1st Brigade. Congress recently approved nearly $250 million in construction spending to house the post’s 4th Combat Aviation Brigade, which is expected to reach its full strength of 2,800 soldiers this year. On February 4, 1968 a good old fashioned tank looked awfully good to me when it came crashing through the brush to get C/1/22 out of an ambush. I didn’t mind the dust or the smell of diesel. I did not ask about the environmental impact it had on the surroundings.